(Newser) – The oldest tree at the White House is set to be taken down later this week, bringing to an end a piece of Americana that's been in place in DC since the mid-1800s. 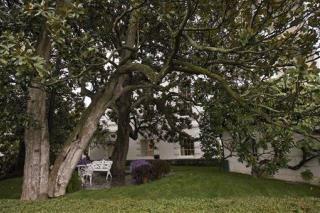 Per CNN, the Jackson Magnolia, one of several magnolias on the presidential grounds, has been the subject of efforts over the years to keep it strong and healthy, but federal arborists were recently brought in and found "the overall architecture and structure of the tree is greatly compromised," according to National Arboretum documents. The only thing keeping the tree erect, in fact, are the cables put in place to hold it up, and that cable system is now starting to falter. A White House official says first lady Melania Trump made the call to cut the tree down after seeing the paperwork, which says the magnolia's woes may have started as long as 50 years ago. Rotten Ole Hickory’s Magnolia is coming down? Wonderful! T’ain’t nothing better than removing all vestiges of that drunken brawling barrister, Native American murderer, ‘centralized government’ hater, Alexander Hamilton hater and ‘all purpose hater’ Andrew Jackson ... one tree at a time. I can’t wait until future generations of Americans reverse all the actions of commie-colluder and draft-dodging coward Comrade Trumpski and remove all evidence that the tax-cheating, vain liar ever existed.